Sizes from 11" to 47". Rated for Ten Gallons Per Minute flowPer Foot of Width. 1" Inlet in back in Middle of Wall,dual inlets on 35" and 47". 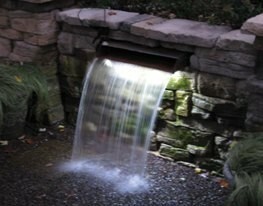 LED Light Strips can be used on spillways[see below]. Internal baffle calms incoming water-creating even smooth flow over lip. Ideal for Foraml Features, Signs and Swimming Pool features.